If you’re looking for a new way to refresh yourself in the late summer weather, look no further than an icy cool granita! This cooling treat is similar to a slushy, but with more crunchy texture. It’s super easy to make, and will instantly cool you down. It’s also very easy to customize using your favorite flavors. I’ve been experimenting, and decided that green tea, ginger, and lemon is my favorite combination so far. The only equipment you need is a sheet pan or shallow glass pan, and room to stash it in your freezer. First, make a ginger-tea infusion. Bring the 3 cups of water to a boil, add the ginger. Boil the ginger for about 3 minutes and turn off the heat and let sit for 30 seconds. After this step, add in the teabags (this is because you should never use boiling water for green tea, it’s too hot and can make the brew bitter). Steep the ginger and tea together for 10-15 minutes. Add in half the lemon juice and three tablespoons of simple syrup. Give it a taste, and add more of both as desired. You can make it as sweet or tangy as you like! Once the flavor is to your liking, pour the mixture into your pan of choice. We like to use a small shallow glass pan, since it’s all we can fit in our freezer. It works just perfectly! Freeze the mixture for about 30 minutes or until it’s just starting to become solid. Then, fluff it with a fork. For the next 2 hours, check on the mixture every 30 minutes (it may need much more than that but keep checking since every freezer is a little bit different, fluffing and stirring to create broken ice crystals. It should be slushy with lots of crunchy ice crystals. That’s when it is perfect to serve and enjoy. If your mixture gets too hard, you can leave it in the fridge for a while, or even blitz it in the food processor for a few seconds. This recipe needs a little attention, but it’s super simple, and in no time you’ll have a perfect summer dessert. Kat recently made this recipe for friends with great success. They loved the crunchy green tea flavor! The zing of ginger and tart lemon makes this light and refreshing. For this granita Kat used Harris green tea. It has a mild vegetal green tea flavor and is perfect to add to any recipe. Kat loves this tea because the green tea flavor is balanced and not overpowering. It’s not too vegetal and is super smooth. For a different spin on this dessert, Kat is actually thinking of making the granita with an herbal tea for her niece Camille. She’s visiting next week and it’ll be the perfect refreshing treat! One bite of this crunchy, frozen treat will instantly cool you down and you’ll imagine you’re in the crisp autumn weather. Dearies I hope you enjoy my favorite new icy treat! Kat strives to drink as much loose leaf tea as possible, but she also has space in her cupboard for bagged teas. Many bagged teas can contain high quality tea, and are easy for on-the-go use. Kat keeps a few tea bags stashed in her purse at all times. She never wants to be without her favorite teas. It’s never fun to drink a poor quality tea, so she always ensures she has plenty to spare. There seems to be differing stories as to how the tea bag was invented. Many folks believe that it started in 1908 when Thomas Sullivan, an American tea importer sent loose leaf samples out in silk pouches, and the recipients plopped the whole pouch in the water to steep instead of removing the leaves first. They liked this method so much that they asked for more. But it appears that there is a patent filed in 1901 by Roberta Lawson and Mary Molaren in Milwaukee for something that appears to be very similar to the modern tea bag. They called it a ‘tea-leaf holder’ and was a ‘pocket-like device’ made out of mesh fabric. Using this holder only a smaller amount of tea would be used for one cup, instead of wasting larger quantities of tea making a whole pot that the tea drinker may not finish. This brought an easy, mess-free solution to tea making. After years of experimenting with different fabrics, paper teabags became popular. The sack style of tea bag was in use until about 1944 when the rectangle became popular. You can of course still find two types of rectangle bags- the ones with a tag and the ones without. Not much changed until the late 80s/early 90s when round teabags were introduced by Tetley (who invented the round bag is also in dispute). It seems that this style wasn’t much of an improvement, but more of an aesthetic change. The pyramid shape was later invented by Brooke Bond. The shape gives the tea leaves more room to expand. Teabags now also come in a few different materials. They can be paper, cotton, gauze, nylon, silk, or biodegradable cornstarch. Phew, dearies is that enough choice for you? For me, I believe that you should enjoy the tea, and not worry what type of bag it comes in. Kat has recently started drinking a few pyramid shaped teabags from HEB. She picks a few up every time she visits her favorite cousin in Texas. Her favorite right now is the Mango Black. The robust, malty black tea base is accented with a subtle, sweet mango flavor. It’s a warm tropical breeze amidst this frigid winter weather. She enjoys this decaffeinated tea in the late afternoon as a warming sip after coming out of the cold, and as an evening relaxer. The pyramid tea bags have plenty of room for the leaves to expand, and are the perfect size for Kat’s favorite large mug that she wraps both hands around. If you’re looking for the ease of a tea bag but would like to use your own loose leaf teas, how about using disposable DIY filter bags? These are large empty tea bags that have an open flap, so you can fill them with your own tea, and then close and brew. Kat keeps these around the house for iced teas. The bags are quite large, and she can put as much leaf as she needs for a whole pitcher. It infuses the tea the same way a traditional tea bag does. These disposable bags can be found in most grocery and health food stores. Whatever shape you choose, you’re sure to get a delicious cup of tea. Do you have a teabag shape preference? I’d love to know! I’m a bit of a nosy teacup, and every now and then I get a glance at Kat’s store receipts when she leaves them on the table. I am always amazed at how much she spends on cleaning products! Why does she need so many different fancy cleaners? Char had a little secret for cleaning her house, and I decided it was time to share it with Kat. Can you believe tea can be used for cleaning? I still remember the day Char discovered tea as a cleaning product. We were at her favorite little Chinese restaurant, the one that always had a line out the door for their divine noodle soups. As Char was about to rest me on the table, a waiter came by and poured black tea all over and wiped it down. You can imagine our surprise to see it was clean as can be. After this experience, Char did a little research on using tea to clean around the house. She discovered it’s a perfect, natural cleaning agent! Char’s favorite use for black tea was to clean the floors. She’d take 3-5 teabags and let them steep in a large pot of boiled water. Once it cooled down she’d transfer to a bucket, and mop. Once dry, I couldn’t believe how those floors shined! I could see my reflection all the way from the countertop. She used the tea solution for the kitchen tile as well as the living room hardwood floors. Black tea is also perfect as a window cleaner. Make a strong brew with 2-3 teabags per 8 ounces of water. 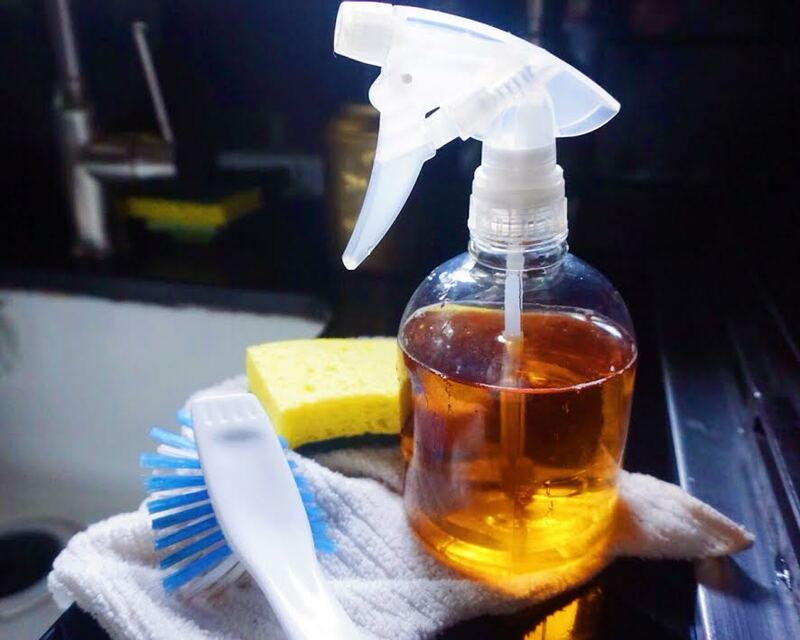 Once it’s fully cooled you can put it in an empty spray bottle, or dip in a cleaning cloth. Wipe down, and marvel at the results. Kat recently visited a tea shop that left a big bowl of used tea leaves in the bathroom. When she asked about this, she was told that the leaves act as a deodorizer. She’s tried this in her own bathroom with great results. Odors are absorbed, and the leaves look like potpourri. It also makes a great conversation piece. You can even try this with used tea bags in the refrigerator. Simply leave them in a small bowl. That cut onion won’t be bothering your butter anymore! Cleaning with tea is economical, easy, and non-toxic! The hardest part is resisting a sip while you are cleaning. Do you clean with tea? I’d love to hear your tips!